Just as its name says, this one is for the frontier. 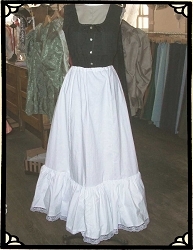 It is a very full skirt, gathered at the waist with a deep ruffle at the hem. Made up in light cotton in solids or calicos. A button waistband. Sizes are by waist measurement. Skirt length is 41". This skirt is of the same great quality you expect from River Junction, but it is just in a fabric no longer available to us. Get it now before it is sold.